Sama Ke Chawal Ki Idli, Dosa or Samvat ki Idli also known in english as Barnyard Millets, Kuthiravali in Tamil, Udalu in Telugu, Shyama in Bengali, Khira in Oriya, Swank in Punjabi, Kavadapullu in Malayalam, Oodalu in Kannada plus other names for Samwat chawals are bhagar,samo, saanwa , samak, saunfiya, samkiye, vari chawal, varai. As only sama rice is allowed in Navratri fasting this idli is made from sanwa chalwa and sabudana (sago/javarisi) so it's vegan, gluten-free and healthy idli, dosa recipe. Barnyard millets or samvat and sabudana both has sweet hint so the idli taste slightly sweet which actually makes the idli and dosa delicious, I didn't use cooking soda or eno (fruit salt) to ferment the batter so one can't expect the idli to bi soft and fluffy like normal idlis we make. If you can take cooking soda while fasting then do add 1/2 tsp of soda in batter before fermenting and it will make the idli more soft and fluffy, the choice is yours. Sama idlis are good change from usual pulao that mostly people making during vrat days, you can make this as snack or even dinner with peanut chutney, green chutney and serve along any other snack. One can also make this idli on normal days it's doesn't have to made only during upwas to relish. 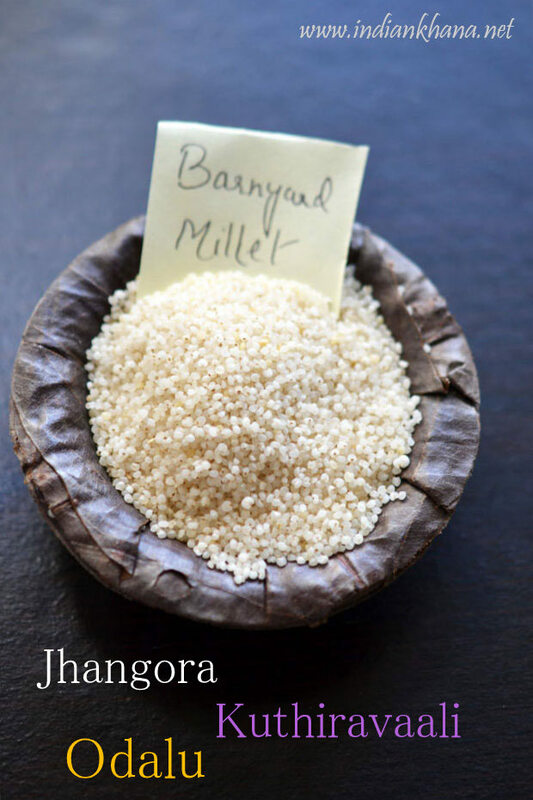 Know more about sama or barnyard millets here. 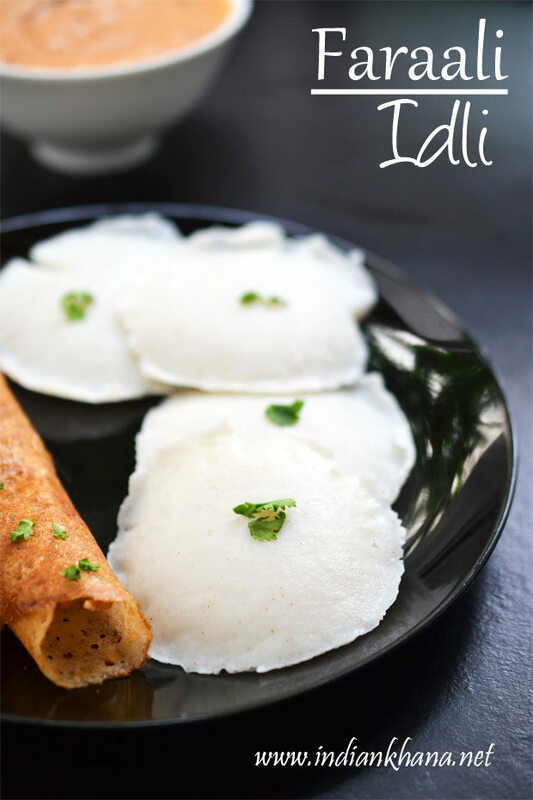 If not making sama idli for fasting then make this as normal idli using urad dal to get perfect idlis which will be still gluten-free with benefits of millets. I also made dosa and it's not crispy like normal dosa but decent enough soft and delicious what more to ask during vrat days. Healthy, gluten-free, vegan idli, dosa made with Barnyard Millets for Fasting or Vrat. Wash and soak Samvat rice/barnyard millets and sabudana/sago separately for 3 to 4 hours., soak sago in large bowl as they will expand after soaking. Drain all the water and grind both samvat and sabudana together in to slightly granular, you don't have to add water to grind as sago absorbs water while soaking. If required add 1-2 tbsp water, other the batter will become watery. Transfer the batter in a large bowl, cover and let it fermate over night or for 6 to 8 hours. When ready to make idli, add sendha namak and mix gently to combine well. 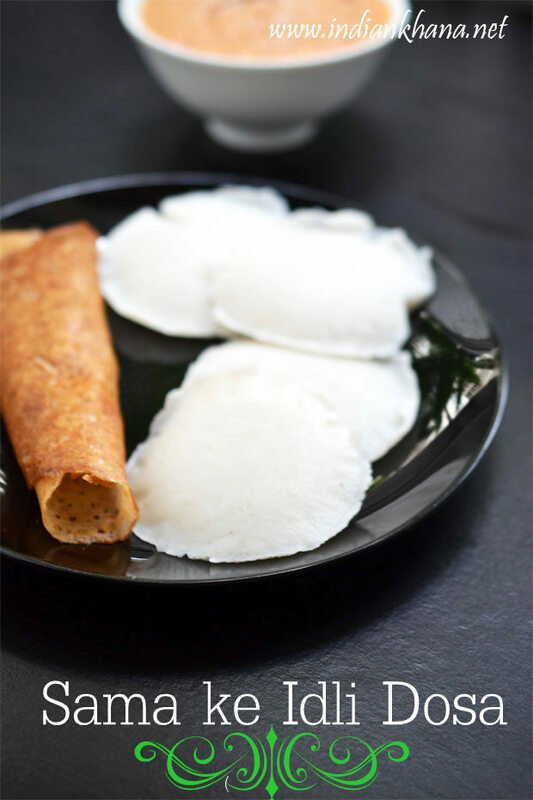 Heat water in idli cooker or steamer and grease idli plates (if using wet cloth lay that on idli plate) fill each impression with a ladle full of batter or until 3/4. Place idli plates on steamer or idli cooker and steam for 8 to 10 mins or until cooked off flame and allow to cool for 5 mins before you open the steamer. Sprinkle little water on each plate, use a spoon to scoop out idli. If using cloth then gently invert the cloth to remove idli. 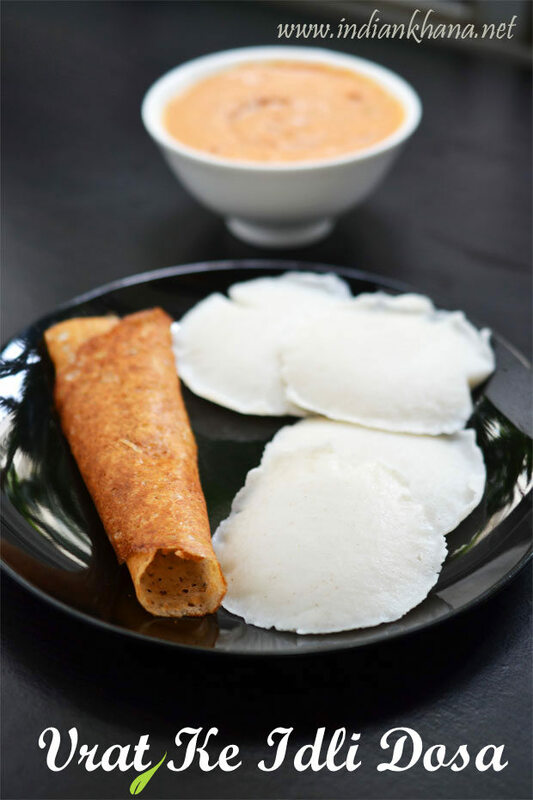 To make dosa, heat tawa and pour 1 big ladle of batter, spread in circular motion to make dosa, don't make it very large. 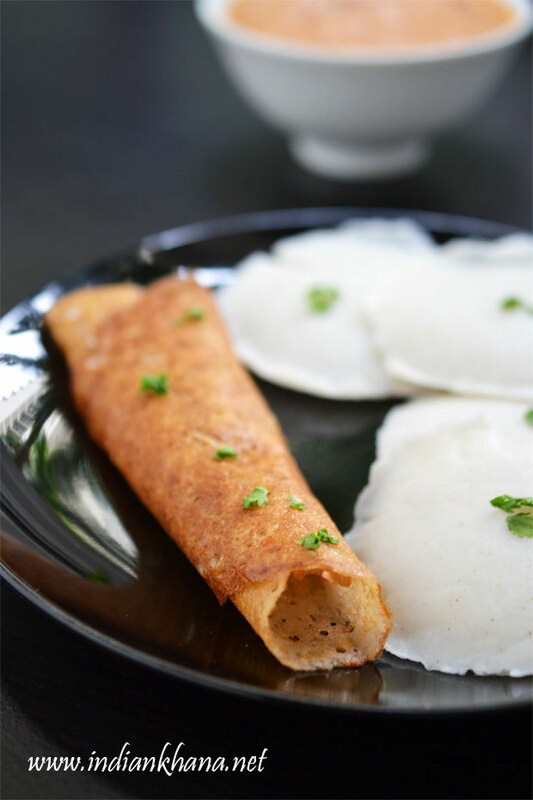 Sprinkle oil on edges and cook until dosa sides leaves pan or becomes golden brown, don't be in hurry to turn the dosa. Flip dosa and cook for a min, repeat for rest (color of dosa differs in pictures due to lighting). If you cooking soda is allowed in your fasting rules then add 1/4 tsp of soda in batter before fermenting, it will helps to yields soft idlis. I didn't added soda. You can prepare tadka of cumin, finely chopped curry leaves, grated ginger and add in to batter before steaming idli to add more flavors. 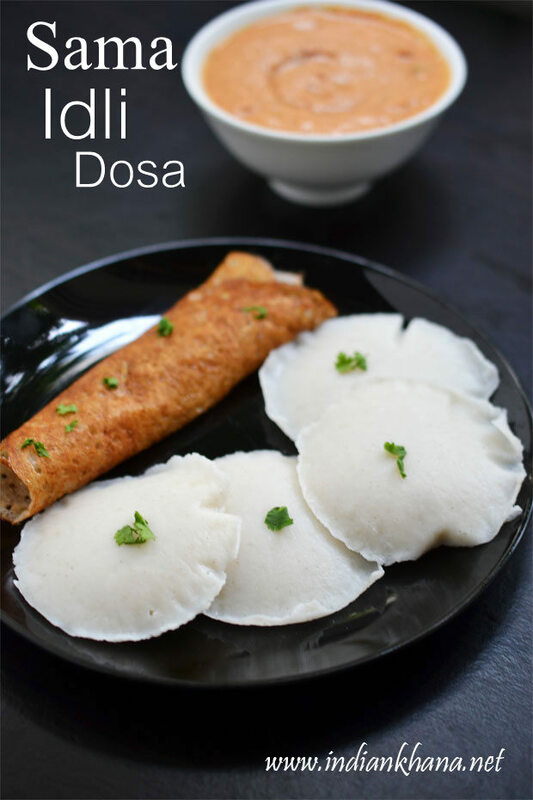 Healthy idli and dosa for vrat.